Morgan’s first-half strike from close range was the difference on an evening where their hosts caused problems for the No.1-ranked side in the world, but Morgan’s volley from Mal Pugh’s cross sealed the victory. Lloyd, who played the majority of the match as the starting forward with Morgan playing from the left, said, “It’s been a really successful year for the team. Going undefeated is a credit to the coaching staff and all the players. Morgan’s first-half strike took her recent record for her country to 25 goals in 26 matches and 18 in 2018 alone, also ensuring she’s now just two goals away from a century for the U.S. While admitting she’s probably in the best form she’s ever been in for her country, Morgan also says playing out wide is helping her evolve as a player. 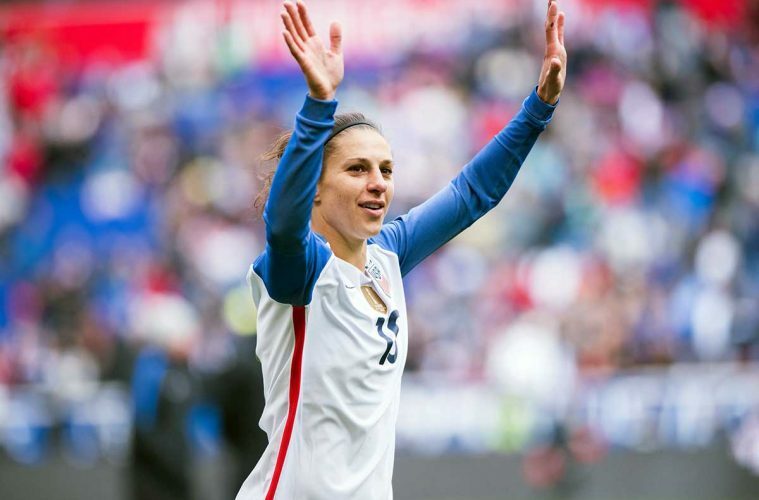 But after a long NWSL season and regular U.S commitments, Morgan admits she’s ready for a short break before returning to Europe to face France in January. Head coach Ellis admitted she was taking her team abroad more regularly now in order to prepare in as much detail as possible for next summer’s World Cup in France, with the trip to Portugal and Scotland the U.S.’s first matches outside of the country in 18 months. “I’m a big believer in getting out of your comfort zone,” said Lloyd. “It’s easy at home because we’ve got thousands of fans cheering our names but on the road it’s difficult. Morgan also echoed her teammate’s thoughts on their first trip abroad since two 1-0 wins against Sweden and Norway in the summer of 2017. “This trip has been great,” said Morgan. “So many domestic games this year but these games challenged us. We expected to dominate Portugal a little bit more but I was really impressed with them. And both players reserved praise for the effort Shelley Kerr’s side put up against the top team in the world with players such as Kim Little, Lisa Evans, and Emma Mitchell all missing from the starting lineup.